We write about our meals. 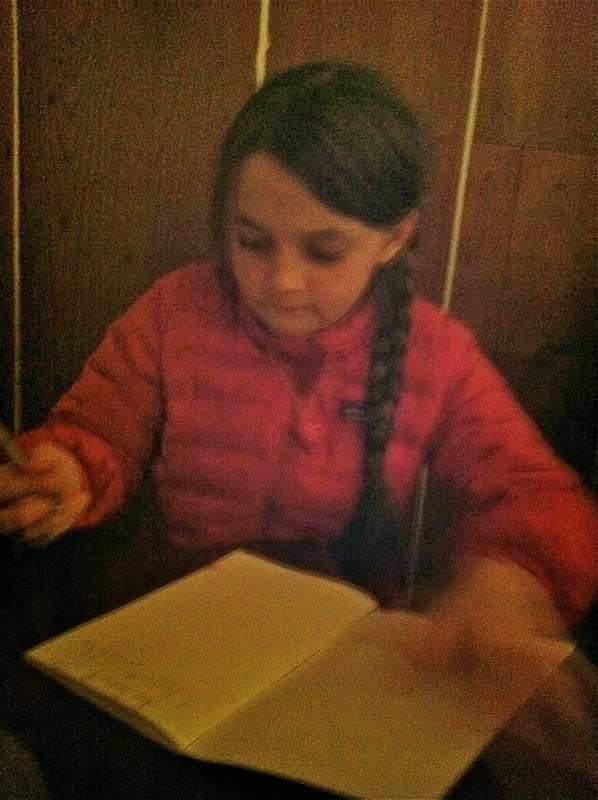 My 9-year-old niece Stella and I go out to dinner every Thursday and this past week, we went to Bar Tartine. Unlike my own children who are timid eaters, Stella’s eyes gleam when she hears the word “oysters” or “mochi” or “black sesame ice cream sandwich” and she will eagerly try any new food you put in front of her, including sea urchin. We spent a good chunk of a car ride several weeks ago debating whether Alison Krauss’s voice is more like “honey” or “syrup” and then sat down to big bowls of ramen, which we analyzed in detail. Girl after my own heart. Bar Tartine is a warm, wood-paneled oasis in San Francisco’s trendy-seedy-noisy Mission District. Great jars of preserved lemons on display, earthy ceramic plates and cups that feel good in your hand. Soft light. Eclectic music. Stella deemed this the “coziest” restaurant we’ve been to yet and from her that is highest praise. The menu, though, was a puzzler. We read it over and over and over and over and over looking for something we wanted to eat, but apart from the bread and butter, nothing appealed. On paper, it was drab and stern, like every dish was wearing a gray Russian headscarf and a pair of work boots. I’d pay $10 not to eat a beet salad with turmeric, sumac, and fenugreek and would only order sauerkraut with green horseradish if I had scurvy. So many roots and bitter greens on this menu, various “black” ingredients, zero enticing adjectives, no creamy polenta or mashed potatoes or cheesy spaetzle or dumplings or harmless attempts at seduction. The descriptions of the dishes were plain and dispiriting, as in chicken with beans, schmaltz and brussels sprouts. Roasted chicken? Boiled? Marinated? Breast or leg? Lima beans, string, pinto, black? Garlicky brussels sprouts? Fried? Oh, forget it. They’ve changed the menu a bit already, but you’ll get an idea of what I’m talking about. Or maybe you’ll find it all tantalizing, in which case: 561 Valencia Street. Happily, almost everything was less austere than it sounded. They just don’t do flirty menu at Bar Tartine. We ordered pork belly, lamb sausage, and some falafel-flavored croquettes and were very content, if not beside ourselves. The best part of the meal was the country bread ($4) from the mother ship Tartine Bakery, which was super-sour, slightly damp, crazy-making delicious. We also loved the “ginger water kefir,” a milky, effervescent drink so refreshing I was tempted to order a refill. There’s a recipe in the Bar Tartine cookbook that I plan to try once I acquire water kefir grains. I hesitate to mention the dessert because I remain baffled by it, but the cheesecake with whey caramel and flax brittle was inedible. Have you experienced whey caramel? It was salty, barely sweet, overbearing, and funky -- almost barnyardy. Is that flavor profile a thing? If so, it’s new to me and both Stella and I recoiled from it. The British woman at the next table, who had also ordered the cheesecake, watched our reaction, wrinkled her nose and said, “It’s awfully ‘cheesy’ isn’t it.” I don’t like sending things back so didn’t, but wish I’d at least asked the waiter what was up with this whey caramel as it’s bugging me two days later. I need the concept of whey caramel explained. Dessert aside, it was a nice experience. I’m glad we went. Unfortunately, other than the water kefir, there was nothing I wanted to rush home and cook. Instead of piquing my interest in exploring the Bar Tartine book, it put an end to it. I talked about my meals at Bar Tartine in the last entry's comments and love your assessment here. It is a really cozy space and it does set you in a different place and time, which I appreciate. One of the meals I ate here was during a recent winter storm and it was wonderful to be in there, until all the lukewarm food arrived. We ordered goulash, an idea which totally thrilled me, but it was so tepid and limply flavored that all of its satisfaction was destroyed. We did have a really wonderful server who described the menu beautifully and made everything sound appealing and delicious, but I agree: it's hard to be grabbed by their dishes as they've written them. I now think of eating there as a Food Experience and not really as a meal -- the sort of thing I am glad to have done intellectually, and maybe even aesthetically, but which in the future I am likely to avoid. It will probably only appeal after I've undergone a great mental and physical ordeal or illness -- eating there is something like taking a healthful dose of an austere tonic. There IS something essential about their food that is unique and curative. But I prefer a bit of decadence when I go out! I would have ordered goulash -- that would have been my top choice! Sorry it was so bland. I think your comment about your body "humming" was really good. What with the kefir drink and the bay laurel and orange tea at the end, it was practically like going to a spa. Lard with paprika and onion? Very stark sounding. We almost ordered it. As a child, I ate fresh lard, onion and paprika on bread. It was delicious. Your niece is a gem! A great partner in crime, I mean, eating out. Could it be that she, too, will have a blog? What would she call it? She IS a gem. I am so grateful my sister shares her. Gosh, telling you what part of the chicken you're going to eat and how it will be prepared seems pretty basic. The servers must get tired of all the questions that could be avoided if only the menu were a little better done. Is barnyardy a thing? All I can tell you is that it is in beer, and I love it there. (The descriptor "horse blanket" always tickles me.) I am unsure about that dessert, but I'm not a huge cheesecake fan to begin with. Never had barnyardy beer and I like barnyardy in cheese -- but this seemed to be in the caramel. Very salty, too, and barely sweet, which I didn't know was possible for caramel. Very odd. What a charming child--and how lucky she is to have you as her aunt! She's very sweet and funny. The dish I would go back there for is the steak tartare. Hands down best version I ever had. I would have ordered that, but I didn't want to give Stella raw meat. Didn't know how my sister would feel about that. The other dish I've since heard was great -- the potatoes. I should have read up before we went, not after. And now I guess I will have to go ask googles what in the world is the difference between water kefir and milk kefir, and if water kefir is just like kombucha, and why do we need all three of them. I can't keep up with all these dang hippie drinks. Sometimes the best genes in a family bounce around and you never know where they will pop up. So glad you have each other. I would love a niece like that. "Barnyardy" said it all for me - thanks. I looked at the menu and much of it seems like up-market versions of things that people would eat during long, cold, Russian winters. Not one thing at the menu jumped out as anything I would want to eat, let alone pay that much money for! "like every dish was wearing a gray Russian headscarf and a pair of work boots." Brilliant! It all sounds pointedly anti-aesthetic, except the setting, which is like a foil. It makes me think of the dinner I had at the French Laundry -- a month's mortgage worth of food that was exhausting and demanding reverence. How much happier I was the next day, relaxing in a booth in a Sebastopol diner chowing down a burger. I'm all for eating at places with a singular, quirky vision, but not when pretension and Concept trump pleasure. I wish my daughter had an aunt like you! Sounds like a wonderful relationship. your description of the menu is hilarious and your niece is a very lucky girl! The menu does look plain, but nonetheless still delicious to me. My husband and his family are from Eastern Europe, and I am from Pennsylvania near Amish country though. The creamed onions and trout, pickled carrots and liverwurst has me salivating. This is exactly how I felt when I went to bar tartine almost two years ago. Bread and butter were life changingly good, everything else was ok, meh, or off in a way I couldn't put my finger on. My fiance adored the blood sausage in sauerkraut, but I just couldn't so I can't say if that would have been a game changer for me or not. No plans to return, except for the bread. Your descriptions of your immediate family's responses to some of your cooking make me giggle, but I also feel a twinge of sadness that you are at such opposite culinary ends. Glad you found someone in the family to enjoy your eating adventures with-what special memories the two of you must be creating!